Avalon Place Houston is a small yet affluent community in the vicinity of River Oaks, the most expensive subdivision in Houston. The neighborhood shares many of the luxuries that River Oaks homes for sale provide. Avalon Place is within the Inner Loop, close to Uptown, Greenway Plaza, Texas Medical Center, Rice University, and Downtown. The neighborhood is also near The Galleria, Theatre District, Memorial Park, Highland Village, and River Oaks Shopping Center. Avalon Place homes for sale are 26% lower than Royden Oaks homes, and 27% lower than Oak Estates homes (both in the vicinity of River Oaks). Avalon Place homes for sale are composed of beautifully updated older homes and a few new constructions. These renovated homes come with substantial upgrades and modern amenities to meet the luxurious lifestyle that the 7th most expensive Houston neighborhood demands..
It’s a very close-knit community and residents rarely move out. The very tight Avalon Place Houston real estate market has very few listings, with some being off-market. This makes it even more difficult for homebuyers to find an Avalon Place home. Having the best Avalon Place realtor helps. For questions, advice, real estate recommendations, or off-market MLS listings, contact Paige Martin, head of the Houston Properties Team and rated as the best Keller Williams Memorial realtor the last four years. I am interested in Avalon Place and would like to get more details. Avalon Place’s history stretches back to the 1930’s when William Thomas Dickey had a dream of developing a subdivision to be called “College Heights”. Unfortunately, he did not live long enough to see its fruition. His son continued the development of the vast farmland despite being sent off to war. After World War II, development took off and the 7 sections of Avalon Place was completed. Nestled between River Oaks and Montrose, the neighborhood combines the grace of Montrose’s historic homes and the luxuries of River Oaks. 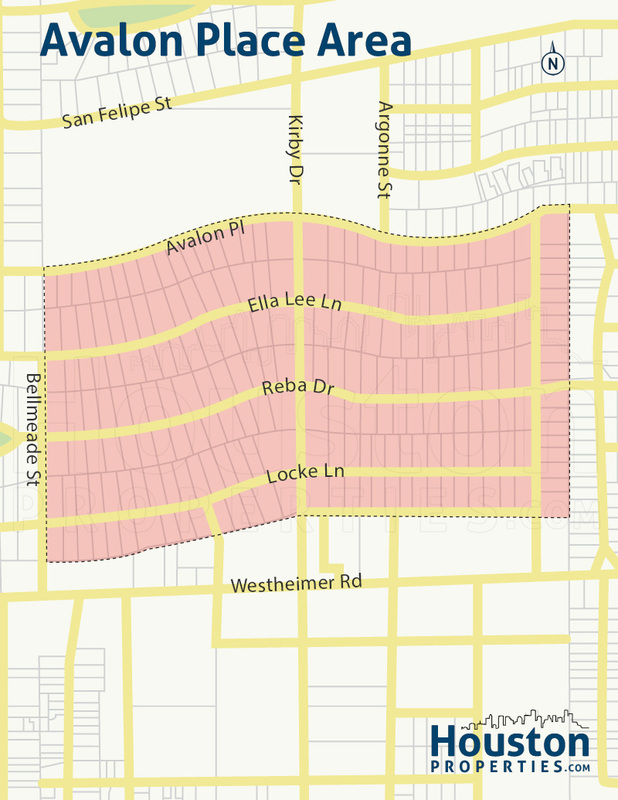 It is located bordered by Westheimer Road to the south, San Felipe Street to the north, Dickey Place to the west, and Bellmeade Street to the east. This neighborhood in the 77019 zip code follows one of the strictest deed restrictions in Houston. The Avalon Property Owners Association enforces provisions on architectural restrictions, single-family use, setback lines, and dwelling orientations. Residents enjoy a unique pedestrian shopping experience. Despite being a strictly residential area, there are plenty of fine dining, musical entertainment, and great shopping locations clumped together along its borders. 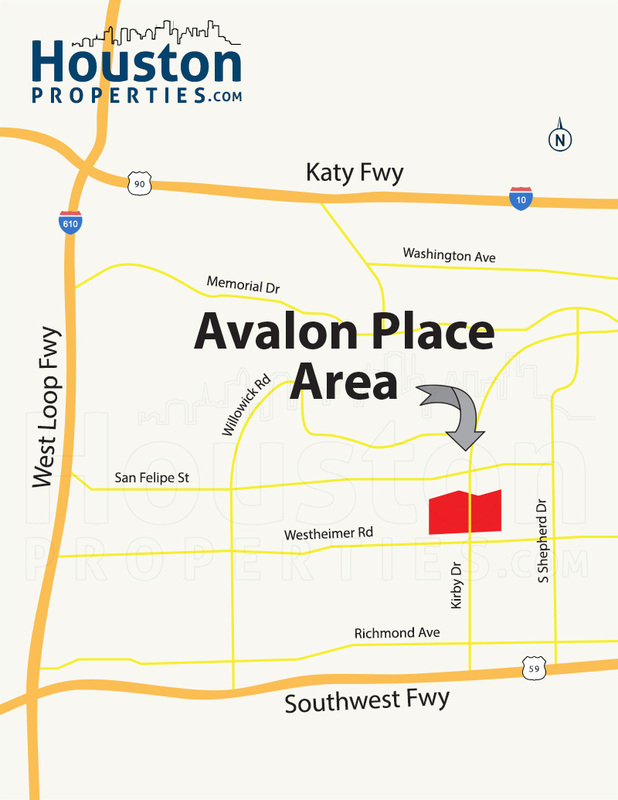 Avalon Place is within minutes from Southwest and West Loop Freeways, making commute to other Houston districts a breeze. Neighborhoods near Avalon Place include: River Oaks, Glendower Court, Oak Estates, Royden Oaks, Highland Village, Lynn Park, Afton Oaks, Chevy Chase, Alabama Place, Hyde Park, Upper Kirby, and Greenway Plaza. River Oaks Elementary School at 2008 Kirby Dr. River Oaks Elementary School is within the neighborhood, at the corner of Kirby and San Felipe. It has an accelerated multidisciplinary curriculum and is one of the first three elementary schools in Texas to acquire an authorization for the International Baccalaureate Primary Years Programme. It has a GreatSchools.org rating of 10/10. Lanier Middle School at 2600 Woodland. Lanier Middle School is a 5 minute drive in Neartown. The school handles students from grades 6 to 8. They received a Texas Gold Performance Award based on language arts, math, reading, science, social studies, and writing in 2011. It has a GreatSchools.org rating of 10/10. Lamar High School at 3325 Westheimer Rd. Lamar High School is just outside the neighborhood along Westheimer and Eastside. The school has a great Athletics program. They have one of the oldest lacrosse programs in the state, and have either won or placed several times in state championships in the past. Their football team, The Lamar Redskins, is one of the highest-ranking teams within the Greater Houston area. Many students in the neighborhood attend the reputable private schools in the vicinity. These schools are some of the highest-rated in Houston, and attract students from all over the city. St. Anne Catholic School is less than a mile away along Westheimer and South Shepherd. It is an accredited Pre-K through 8th grade with a National Blue Ribbon Status from the Department of Education. It has a GreatSchools.org community rating of 4/5 stars. St. John’s School, is along Claremont Lane, a 5-minute drive from Avalon Place. It is one of “America’s Elite Prep Schools” according to Forbes.com and “the best private school in Houston” according to the New York Times. St. John’s admits students from K-12. River Oaks Baptist School accepts students from preschool to middle school. Located along Willowick Rd, the school focuses on a firm foundation in academics, character education, and spiritual development. The school has received numerous recognitions for their foreign language and arts programs. To find an updated listing of all Royden Oaks real estate zoned to any specific public school, please email Paige Martin atPaige@HoustonProperties.com with the property type and budget that you’re looking for. Paige is ranked as one of the top realtors in Avalon Place Houston, and the state of Texas. Read more about the over 65 awards she’s won in the last few years.